Ana Tiscornia, Uruguay 1951, resides in New York since 1991. She is Emeritus Professor from State University of New York at Old Westbury. 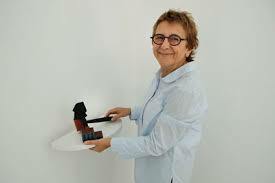 Among her recent exhibitions are OMI, Ghent, New York; Colateral o premeditado, Galeria Nora Fisch, Buenos Aires; Des-habitaciones, Galería del Paseo, Lima; El estado de las cosas, Museo Gurvich, Montevideo, and Paradoxes, Josee Bienvenu Gallery, New York. Tiscornia wrote for several publications, among them Semanario Brecha from Uruguay; Art Nexus from Colombia; and Atlántica Internacional from Spain. She is the author of the book Vicissitudes of the Visual Imagery: Between utopia and fragmented identity.